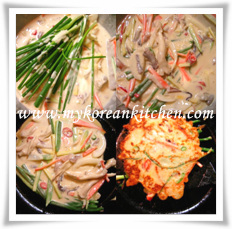 Easy and delicious Korean squid pancakes. A perfect appetizer! 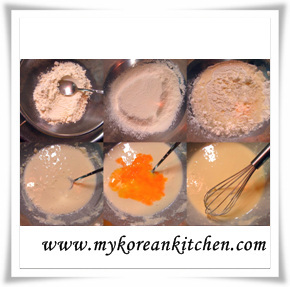 Korean pancakes (Buchimgae, 부침개) are very popular on a rainy day among Koreans. There are a couple of theories about the reason, but I don’t really know why. The other day my husband told me he wished it rained all the time so that he can eat this Buchimgae all the time. He reckons that I will make it every time it rains. 🙂 He is such a Buchimgae killer! 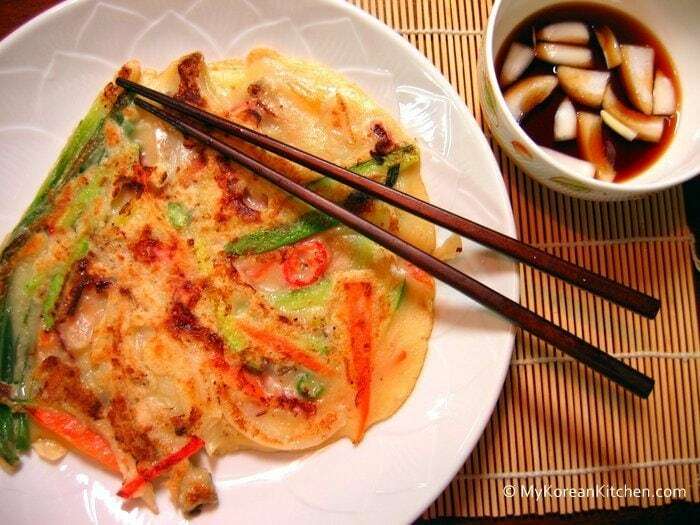 You can pretty much make any kind of Buchimgae by adding different kinds of ingredients and one of my favourite variations are these Squid pancakes (Ojingeo Buchimgae, 오징어 부침개). 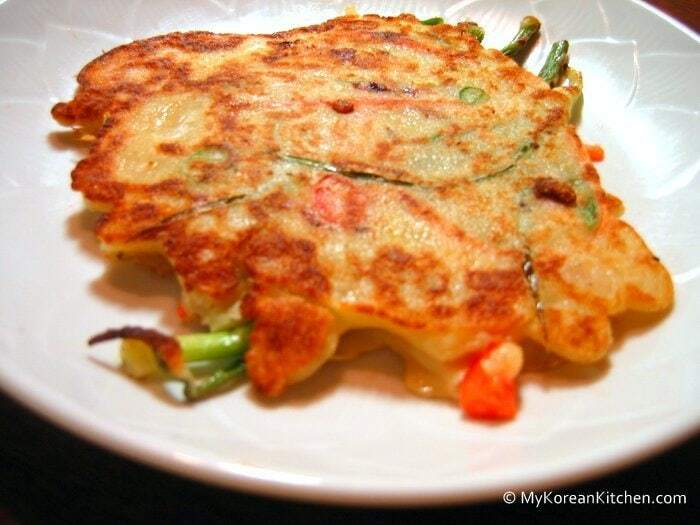 This savoury and crispy Buchimgae always has been my favourite. I hope you like it too! You can make about 6 pieces of squid pancakes with the below ingredients. However 3 pieces were quite enough as a meal for me and my husband, implying that it’s quite filling. As for the dipping sauce, if you don’t want to be bothered with making it separately, you can just use soy sauce instead. However, the dipping sauce I’m introducing to you today really enhances the overall taste of the pancakes. So I hope you give it a try! Happy cooking! Rinse all the vegetables, and peel the skin off as needed. Thin finger length slice the carrot and zucchini. Thin angle slice the red and green chillies. Cut the spring onions into halves or thirds. 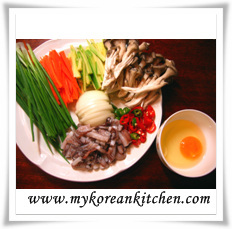 Cut the squid legs into half finger length, put it in a bowl and add the black pepper on top. Sieve the flour and the salt. Add the water and mix it thoroughly so there are no lumps. Add the beaten egg and mix it well again. 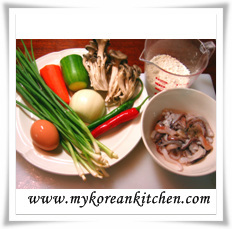 Add the prepared vegetables and squid into the flour mix. Pre heat the frying pan for about 10 seconds. Scoop out the final mix with a ladle, put it on the pan. When both sides are cooked, serve it on a plate. Thank you so much I have been looking for these for probably 25 years,I can’t find them in restaurants but now I have a recipe. 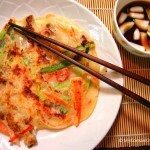 My fathers ex wife was Japanese she introduced me to these when I was young haven’t had them since.She got them at a local restaurant and called them Korean Pancakes.This happened when we visited them in Georgia,we lived in Arizona at the time,couldn’t find them there,now in Colorado and can only find scallion pancakes. Going to make these for dinner tomorrow thank you once again!! I can’t believe you’ve been looking for this recipe for 25 years! That’s a very long time. 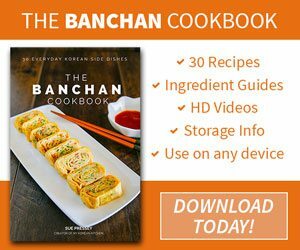 Can’t thank you enough for all the KOREAN recipes that you’d posted here. 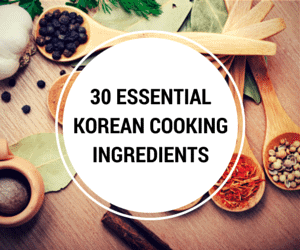 We we living in Busan for 2 years (1999-2001), but I learnt NOTHING in Korean cuisine and regreted it so very much. 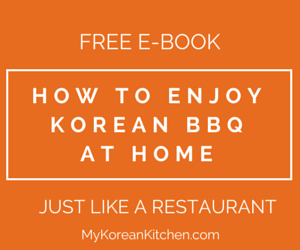 Now, since I’d found your site …I’m ready to learn every Korean Food that we used to love when we lived there. Thanks a bunch !! God bless You, always.